Coast are healing, rebuilding, and dreaming bigger. Nat Turner was one of countless volunteers from New York who raced to New Orleans after Hurricane Katrina five years ago, hoping to help with the rebuilding. Turner was a high school history teacher in Manhattan who brought more than 2,000 students to New Orleans on a bright blue school bus with the name of his organization painted on the sides: "NY2NO." Over a two-year period, Turner drove busloads of kids back and forth to pitch in with cleanup work. But long after most relief workers had left, and as the number of volunteers dwindled, Turner recognized that there was still so much more to be done and the city was still in need of grassroots organizing and support. 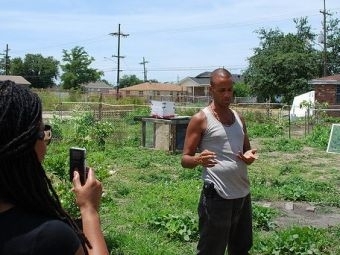 He decided to stay, centering his efforts on the most devastated part of the city, the Lower Ninth Ward. To date, only 10% of that community has returned – with only one school open and no services like stores and hospitals. His students and trainees at Our School at Blair Grocery are learning to grow organic produce, which they’re now selling to local gourmet restaurants. This week on The Promised Land, Majora Carter visits New Orleans East, the most dense ethnically Vietnamese population outside of Vietnam. In the Gulf region, about 80 percent of Vietnamese Americans were connected to the fishing industry, and the BP oil spill hit the community hard. In the fall of 1960, the writer John Steinbeck drove across the country with his poodle, Charley, and a question: "What are Americans like today?" Half a century later, "Travels with Mike" retraces Steinbeck’s steps to hear America’s story today and reflect on its history.